College football is coming up roses. A whole of them. The NCAA Division I college championship on Jan 12. is the official day that a champion will be crowned. On Jan. 1, the mythical college football championship game between Oregon and Florida State in a semifinal playoff contest at the Rose Bowl in Pasadena, California, will play itself out. Sure, the other semifinal contest between top-ranked Alabama and Ohio State is a prime-time game worth turning on the television to watch.Both of these schools are in the upper echelon of college football programs. Both have superstar talent that lead them to NFL stardom one day. However, Oregon and Florida State will bring out some star wattage of their own with current Heisman Trophy winner in Oregon quarterback Marcus Mariota trying to match wits and touchdowns with the man he replaced as the best college football player in America in Florida State’s stud signal-caller Jameis Winston. 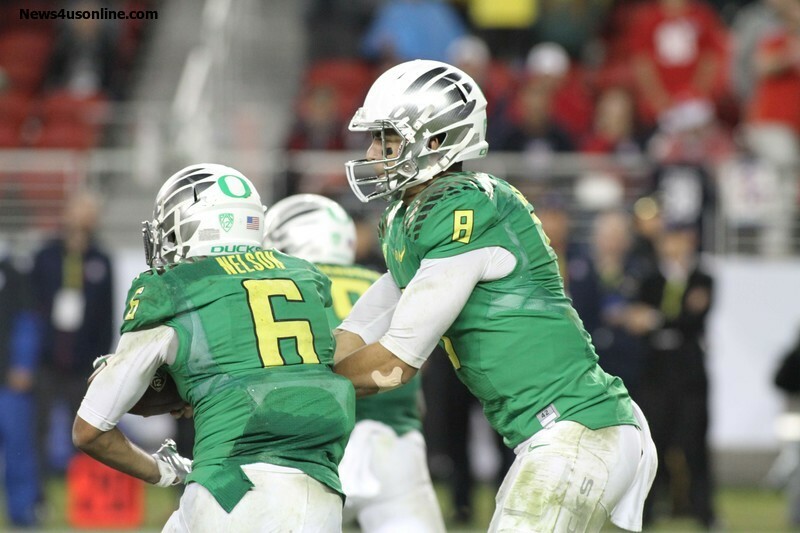 Mariota picking up and winning the Heisman Trophy as the best college football player during the 2014 college football season will bring an interesting twist to the College Football Playoff semifinal game. 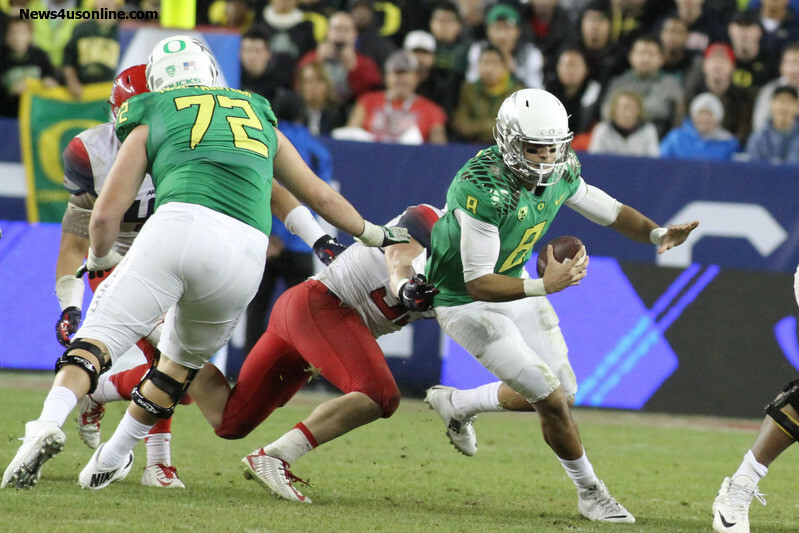 Except for an early season blemish against Arizona, whom they demolished in the Pac-12 Conference Championship on Dec. 5, Mariota and Oregon’s fast-paced offense have dominated opponents with reckless ease. That can be either a good thing for the Ducks or a bad sign of what’s to come. Teams that usually blow out opponents on a consistent basis usually play tight and nervous in real close games on the big stage. That may or may not be the case with Mariota and Oregon, but all eyes will be on the Ducks to see what they do when they roll up against a team with the resiliency of Florida State. The only two real close games that Oregon has been involved in was the early season defeat to Arizona and a seven-point win against Washington State. Other than that, it’s been Blowout City for the Ducks this season. Mariota, with a 68 percent completion rate to go along with his 3 783 yards and 38 touchdowns against just two interceptions on the season, has been the maestro conducting Oregon’s success. Now with his Heisman Trophy in tow, the only challenge for Mariota and the Ducks is to go out and claim the school’s first national title. That’s a lot easier said than done. The problem for Mariota and the Ducks is that they will likely face a Florida State team that will be playing with a bit of a chip on their shoulders. Expect Mr. Winston to lead the Seminoles in the “us against them” attitude department. The Seminoles, last year’s national champions, haven’t lost a game in two years, running the table with a 14-0 mark last season, and recording 13 straight wins in 2014. Heck, Florida State isn’t considered to be the top team in the country. That distinction belongs to Alabama, ranked No. 1. The Seminoles are the only team in college football’s final four without a defeat. They’re unbeaten partially because of luck, good talent and great coaching. Oh, by the way, the ACC champs also have this player in Winston who continues to come up big when his team needs him the most. 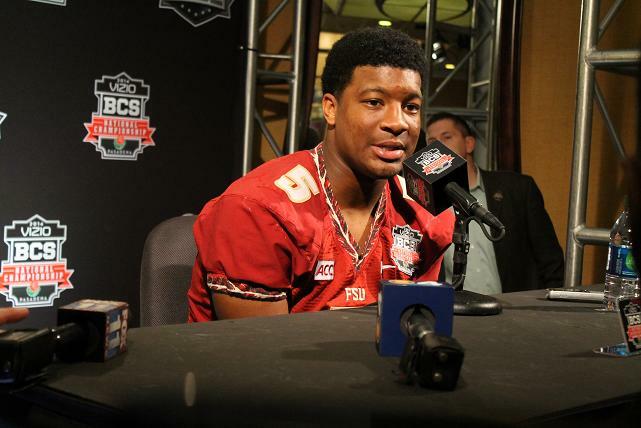 Though he doesn’t have the staggering numbers (3, 559 yards, 24 touchdowns, 17 picks) from a year ago (4, 057 yards, 40 touchdowns, 10 interceptions) when he won the Heisman, Winston has shown fortitude in leading the Seminoles back in the national title conversation. Though that wasn’t good enough for him earn another trip to New York for another Heisman presentation, Winston has big-time written all over him. This kid doesn’t waiver in the face of adversity. This should concern the Ducks, who will face the best quarterback in the country outside their locker room on New Year’s Day. Heisman winner versus Heisman winner. Speed going up against guile. Flash versus preserverance. The Pac-12 Conference champs matching skills with the ACC title-holder. No. 2 Oregon sizing up No. 3 Florida State for the right to play in the national title game. Seems like college football is already a winner.